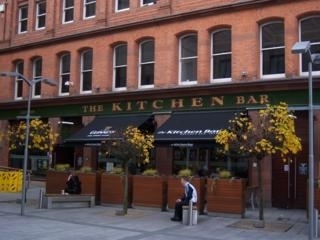 The Kitchen Bar is located just beside the Victoria Square shopping development and is a replacement for the old Kitchen Bar. This bar is a popular stopping off point for shoppers. The old Kitchen Bar was demolished on Friday 30th July, 2004. Have you got Google Earth on your computer? If so, then download the Google Earth view of The Kitchen Bar. Click / Tap the button above to get directions from where you are to The Kitchen Bar. I couldn't beleieve the comments on this page. Our night out was amazing. The staff and the service were impeccable. We had no complaints. Yes the bar was very busy but that is to be expected at the weekend. The staff had a bit of craic with us as well which was quite refreshing rather than just average run of the mill service that you get where you realise that the staff aren't really interested in you one way or the other. The food was great just what we wanted good, affordable pub grub. Had a quiet drink in the Kitchen Bar a few days ago. Nice atmosphere and pleasant staff. Thought the paintings were amazing! Worth a visit just to see them. Does botanic inns employ anyone under the age of 45? if so maybe they could let them work on a sat night in the bar. the staff cant get about as fast and are slow at serving so if you on a night out on the sauce do not venture here!!!!! Marks out of ten would be a four and that is being nice really! was shopping in the victoria centre and thought kitchen bar would be somewhere easy to get food. i had my child with me and there really wasnt enough space to bring a pram into the bar. i would say it is very un-child friendly as when i asked for a jug to heat the bottle they gave me a tea pot that the bottle wouldnt fit in! i requested a bowl and wasnt given a latte glass - er how was this to heat the bottle i dont know. i asked a waiter for a jug and he said they only had one in the establishment and it was being used and he couldnt help me???? so i asked someone else for a bowl to heat the bottle and they gave me a bowl full of hot water. However the food was quick but average! i had fish and chips with bread. bread was a bit hard and my mum only got half a slice of bread but on the whole it was eatable just about. service leads alot to be desired. the staff seemed stressed if they have more than two tables in. i would only recommend this bar for quiet periods and for a quiet drink. I visited this bar a few weeks ago when I came for a weekend with my girlfriend to Belfast. The bar was amazing....the bar was nicely decorated but what really made it amazing was the musicians they had playing. There were 4 of them on a Saturday afternoon and they were truley mind blowing. Totally traditional Irish music but with a Belfast twist as it was the fastest I have ever heard it being played!! I would visit again in the promise of listening to these brill musicians!! The only bad thing about that bar (even though I didnt sample the food) was that the Trad Music Group stopped playing!! Totally excellent! Truly wonderful bar.. great food, good music and a smashing pint of guinness!! The staff are amazingly friendly and will bend over backwards to accomodate you! EXCELLENT!